The architect of the Central Idaho Economic Development and Recreation Act announced significant changes Sunday morning to the legislation that would designate 318,765 acres of the Boulder and White Cloud mountains as congressionally mandated wilderness. Amidst stained timbers at Redfish Lake Lodge in the Sawtooth Valley, Congressman Mike Simpson told those in attendance at the Idaho Conservation League's annual Wild Idaho! conference that he is eliminating two of the most controversial land conveyances from the bill. There were previously a total of 28 land gifts. One of the parcels includes 86 acres on a bench to the north of Stanley. 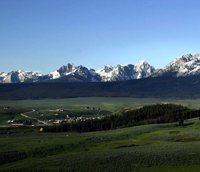 The land, which is within the borders of the Sawtooth National Recreation Area, would have been given to Custer County and would have provided for 10 home sites. The second parcel included eight acres of SNRA land within the borders of Stanley. It would have been given to the city of Stanley and could have been sold for four home sites. Because the conveyances were designed to benefit Custer County and Stanley, a fund will be established to compensate the rural, agrarian county for the lost 86 acres. The "up to $3 million" fund will be fed by diverting 25 percent of all proceeds from the leasing of minerals on federal lands in Idaho. That money now goes into the federal treasury. Moreover, Simpson announced he is removing a 503,737-acre Boulder White Clouds Management Area from the bill. The area would have ringed three core wilderness areas in the mountain ranges, and its purpose would have been to "statutorily provide for the continued management of such lands for motorized and other recreational opportunities, livestock grazing and conservation and resource protection in accordance with the existing management areas, plans and applicable authorities." The Boulder White Clouds Management Area had been controversial because it was viewed by critics as something that could potentially undermine federal protections established in 1972 with creation of the SNRA. "I'm not often speechless, but was today when I heard Rep. Mike Simpson speak at the Wild Idaho! conference," said Boulder White Clouds Council Director Lynne Stone. "It's rare there is any good news in my conservation work, but today, unexpected, this was mighty good news." As he has in the past, Simpson pointed out the "knife-edge" nature of his legislation, which he describes as a compromise that attempts to appease many different parties. He said he believes his bill and separate legislation for the Owyhee canyon country in Southwest Idaho, sponsored by Sen. Mike Crapo, R-Idaho, are models for how wilderness debates will be sorted out in the future. Nine years prior, Simpson attended his first Wild Idaho! conference at Redfish Lake. It was at that conference that he announced he would try to sort out the Boulder and White Cloud mountains wilderness puzzle, which has been outstanding for some 30 years. The more than 500,000 acres of road-free lands constitute the largest unprotected road-free chunk of land in the contiguous United States. This spring was Simpson's eighth Wild Idaho! It was his chief of staff's sixth. "They're listening. Clearly it says they're listening," said ICL Executive Director Rick Johnson. "I think the most important thing it does is that it says to the House Democrats that they're not messing around." Simpson said both the Central Idaho Economic Development and Recreation Act and the Owyhee Initiative have been enabled by a bipartisan spirit of cooperation. "The environmental community for a long time became very good at stopping things from happening," Simpson said. "Your reputation and your work has changed, not that your goals have changed, but your methods have changed. All of a sudden you've got county commissioners and ranchers who will talk with environmentalists. That's huge. That's how you get things done." Simpson appeared optimistic about the bill's chances this congressional session, but said if it does not move now he will reintroduce it again next year. "I actually think the work we're doing here ... may be among the most important work we're doing in Congress," he said. Johnson called the work in the Boulder White Cloud mountains and Owyhee canyon country "a movement." He said the foundation of the work—consensus-oriented wilderness bill construction—will stem far beyond the wilderness debate. "What we have learned in the Boulder-White Clouds, what we have learned about the Owyhee, influences everything we do," Johnson said. "We are making history. Even if we fail we are making history."